A lifetime inventor and entrepreneur, Tom Dickson was innovating long before he built his first blender. With multiple patents to his credit, he started Blendtec in 1994. Thinking outside the box, he developed blending blades and containers that are different than what was typically on the market. With powerful motors and a unique blade configuration that pulverizes and doesn't need to be sharpened, Blendtec units are long lasting. Most blenders will encounter ice at some point of their life and many are used to crush ice all day. Imagine cutting an ice cube with a sharp knife at high speed. Even the sturdiest stainless blade is bound to start chipping. Besides ruining the blade, metal flakes can end up in a drink. The Blendtec blender uses non sharpened heavy duty metal blades that pulverize ice, not cut them. The containers are strategically designed to make sure that all items end up sliding down to the blades. Because the blades are not sharp and curved at the ends, kind of like aircraft wings, there is no danger to stick your hand into the container and wash it thoroughly. 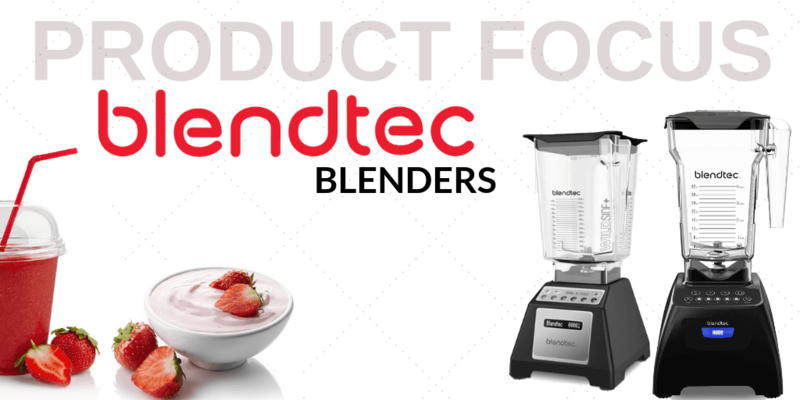 Blendtec blenders have more torque and therefor produce more noise. That's why they offer sound reducing isolating enclosures for units being used in a bar or public space. Further Blendtec innovations have introduced a dispensing system. All Blendtec machines look modern and have simple and universal operating controls. Some have easy to understand digital readouts. This is a product line for the 21st Century and that's why CKitchen.com is proud to present the line to you.